The Tokyo Shimbun's cartoonist extraordinaire Sato Masaaki had another great one up in Saturday's newspaper, lampooning the prime minister's reactions to last week actions in the Diet and at the Kantei. The side board reads: "As for the hostage incidents, day after day in the Diet, an exhausted countenance..."
The caption at the bottom reads, "Still full of vitality after all!" Guess constitutional revision is a big Abe favorite. Who would have known? 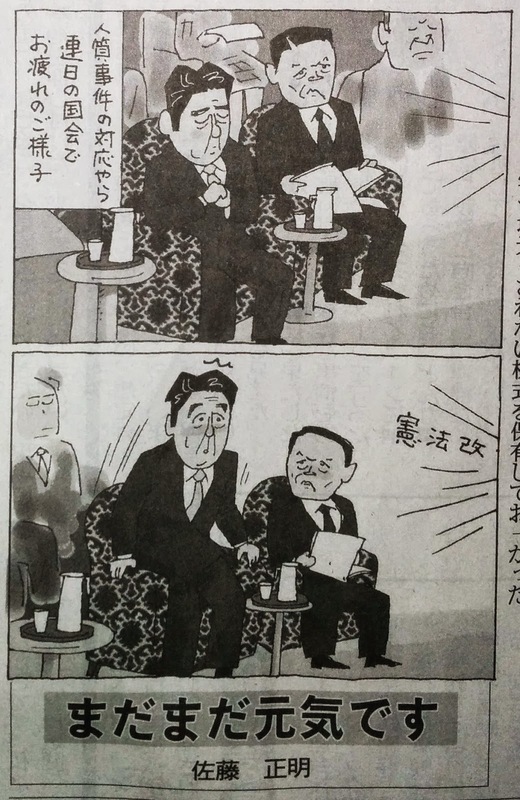 What I love best about the cartoon is the attention paid to Abe's body language. In the first panel, Abe is depicted holding his hands. Sure, everyone has to do something with his or her hands during the 6 hours plus he or she is sitting in the chairs in Diet Budget session (there is a lunch break after the three hour point). Some Cabinet members hang on to the armrests like they are trying to ride out a gale. Others grip sheaves of paper, some flippantly, some as if for dear life. Abe, however, has a particular nervous habit. He grasps the three fingers of one hand in between the thumb and forefinger of the other, squeezing and wringing his fingers. 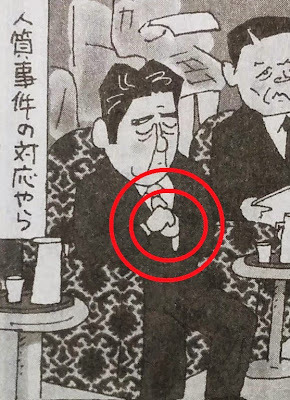 He does this hand dance most frenetically when he is being put on the spot, like he was during last week's questioning about his actions and the actions of his government during the Yukawa/Goto hostage crisis. Sato must have been watching last week's session on the NHK live broadcast. NHK's cameras lingered on the PM even when someone else was speaking, giving the pubkic an up close look at the PM's nervous "tell." I am not fond of writers who use the word "should" when writing about the politics of Japan. However I would suggest to Prime Minister Abe that if any of the casinos that he has been eager to see built actually gets built maybe he should stay away from the poker tables. JA Zenchu Reform - Really?